These are four-season tents. 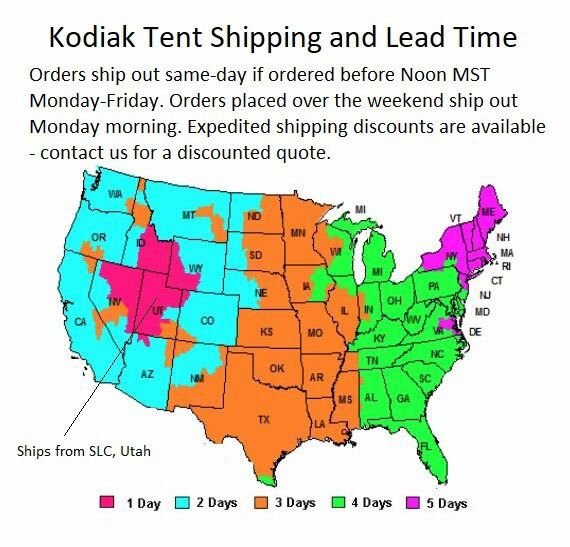 In fact, if you have ever been to the burning man festival in the Western Desert you will see what appears to be a tent city filled with Kodiak canvas tents. They offer shelter from the burning sun, the harsh winds, and keep out water and dust alike. Are you a hunter who is gone for days or weeks at a time alone or with a group of buddies? These tents are ideal making it a great experience for you and your friends. YouTube has a plethora of videos from our hunting customers who were caught in severe snowstorms and other weather. It turned a storm into an adventure as some point out that other hunters on the mountains had to abandon camp for local motels. These tents are also stylish and good-looking; something you can be proud of showing your friends. Many hunters find us not through an internet search, but are referred by friends whose tents they have seen firsthand. Having seen one for themselves they are convinced that they are a great purchase. 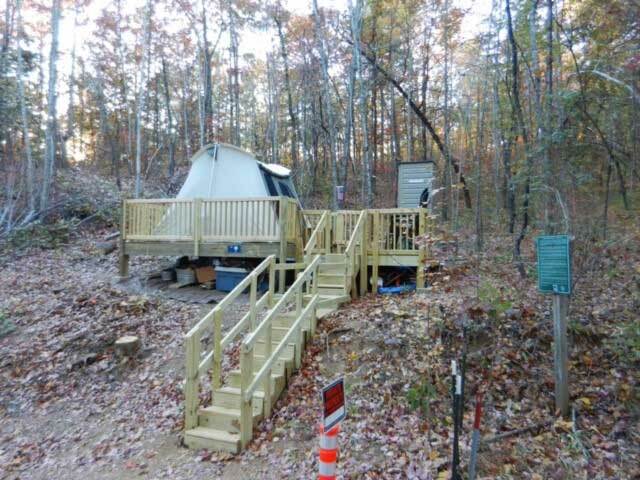 This Kodiak Canvas Tent is the perfect tent whether your are camping with your family or with your hunting buddies. This rugged, all-season tent is well suited for any occasion. Made with premium grade, Hydra-Shield 100% cotton duck canvas (walls: 8.5 oz , roof: 10 oz). The tight weave and silicone finish make the canvas watertight yet breathable, minimizing condensation and mugginess. Go ahead and touch the inside walls during a downpour this canvas will not wick water. The Flex-Bow frame has tempered, spring steel rods that keep the tent taut, and robust 1 inch? steel tube poles that will hold up to fierce winds. 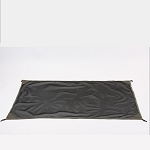 The floor material is a super-duty, puncture resistant, 16 oz vinyl with welded seams that keeps water out. 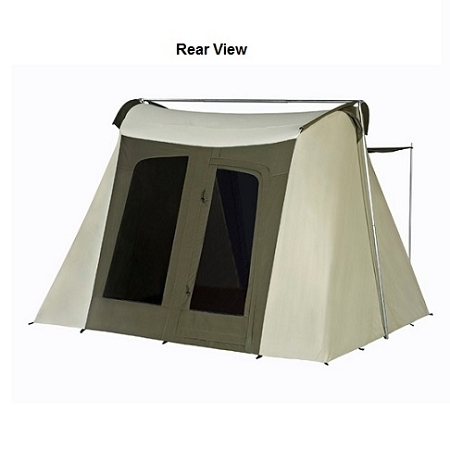 The main difference between this tent and the 6055 model is this one has 4 windows as compared to the 6055's two windows, for added breathability and ventilation. Easy, one-person setup takes only a few minutes after you have it staked out. The steep walls and 6 inch high ceiling provide a roomy interior with stand-up, walk-around comfort. Two large doors with top rated #10 YKK zippers give convenient access to front and back. Four windows, and two vents allow ample air flow. Windows and vents have no-see-um screen mesh, keeping out the smallest pests and giving you added privacy. 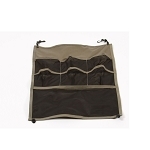 A customizable gear loft, and organizer system offer plenty of places to stow gear. A large awning provides shade and a covered entry. The handy large storage bag means no cramming into an undersized bag. Hefty 12 inch? steel stakes included. Flex-Bow Frame: Exceptionally sturdy. Keeps tent taut. Quick and easy, one-person, setup. Two large D-shaped doors (front and back) with YKK zippers. Each door has a flap for additional windows to allow ample ventilation. Heavy-Duty 12 inch, steel rod, stakes. Unlike many other stores, Competitive Edge only sends these with the new upgraded improved metal reinforced stake loops. Approximate Weight: 68 lbs (Includes tent, poles, stakes, and storage bags). Frame: 1 inch, galvanized, steel tubing. Flex-Bow Rods: 3/8 inch, solid, spring steel. Shipped very fast! 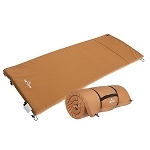 Tent and ground tarp are very well made. Setup was extremely easy. I seasoned the tent as instructed and found no leaks inside. The water beaded off the canvas as advertised. Will use next week on an antelope hunting trip to Wyoming. If you want a high quality tent that should last a long time. Then buy this tent. I only wish I would have bought the 10 x 14 deluxe model for more room but the 6010 will work most of the time for my needs. Just buy it. You wont be disappointed. After weeks of research I settled on this tent. After wearing out my previous canvas tent my only goal was to find another canvas tent. Every review I read left it a clear choice. The Kodiak was the way to go. do not waste your time, I have already done all the research needed. THIS IS THE TENT TO BUY, hands down the best! I love camping in fact my family and I go camping twice a year and I have tried different types of tent and the Kodak is the best I have seen so far no leaks when the rain fall, standing room inside,stands up to strong wind and cool enough inside on hot days, I have recommended this tent to some of my friends who also bought and are also satisfied. Ive always been a big user of the dome tents not a large canvas tent until I was given one. After using the canvas tent for a couple of years I felt it was time to upgrade to a new and larger canvas tent.After searching for one I found it here on Competitive Edge Products web site. I ordered it on a Monday morning expecting not to see it for a week and the tent was sitting at my door step on Tuesday. UNREAL! Thank you Competitive Edge! I need a tent that I can set up by myself so immediately I started setting this 10 x 10 Kodiak tent up . It was very easy to set up and what a tent. There will be many years spent camping with this tent. Thank you for an excellent product. Have not camped in it yet, but will this weekend. Set it up in the yard. Very easy to set up. Very heavy duty. Seems like a tent I could hand down to the kids in years to come. Came right on time too, the same day it was schedule for. 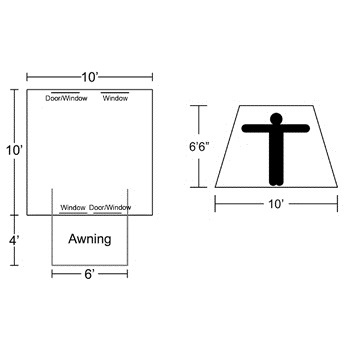 Q: Why does the 10x10 show a 72x78" awning but the 10x14 says its awning is 4'x7'? 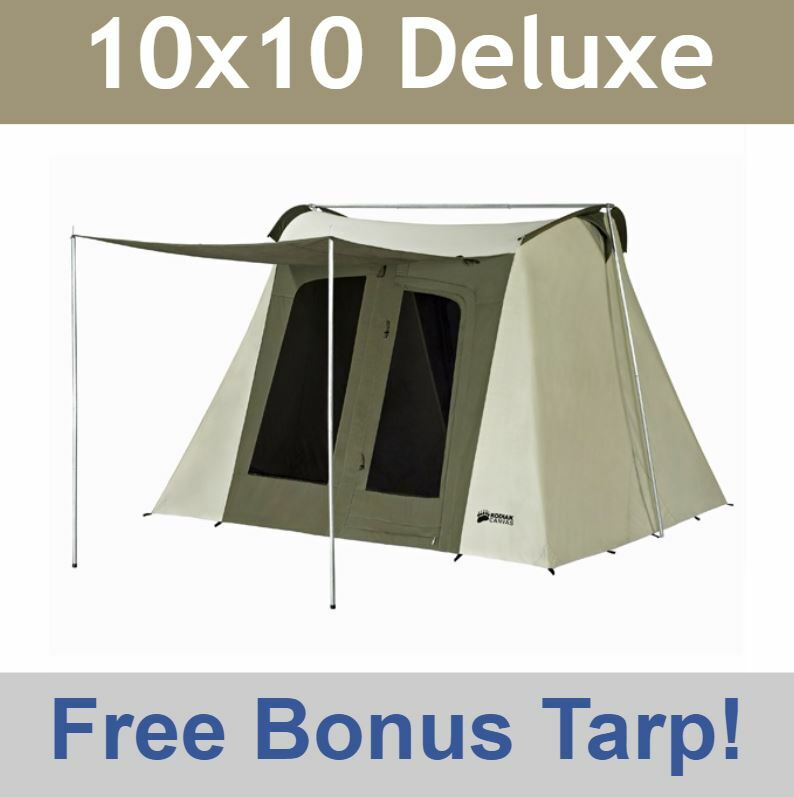 Is it true that the 10x10 has a much larger awning? A: The awning on the 10' x 10' tent is 4 feet deep by 6 feet wide. The awning on the 10' x 14' tent is very similar, but it is 4 feet deep by 7 feet wide. Where does it show 72x78"? Q: Are you able to ship to Alberta, Canada? Q: I currently have the 8'x9'. Are the doors in the 10'x10' deluxe the same size or are they a little bit bigger? A: They are the same size. Q: Does this have side windows? A: This does have four windows and airflow vents, but it is not the model that has the large triangular side windows. That would be model number 6043. If you search for that on our website it will pull it up for you. Feel free to contact us with any other questions. A: This means that if you order this in the morning it will ship out the same day. You still choose the shipping method during checkout. The free shipping option is FedEx ground and depending on your location can take 2 to 7 days. They ship from Salt Lake City. The surrounding states take about two days. We do email you the tracking information as well. Q: Does the shipping cost to Canada include shipping and handling fees? A: Shipping to Canada is not free, but we can ship to Canada. If you pay the shipping cost to Canada, (this can be calculated once you add the item to your cart) then you will not need to pay an additional delivery or handling charge. Q: To use this as a base camp with cots and gear, how many people will fit comfortably? I know it says six, but that usually means no gear and ground sleeping. A: The 10'x10' tents are usually quite sufficient to hold 6 people, depending on the amount of gear. With 6 people, a general layout might place 5 people side by side with their feet facing the entrance, that would give them each roughly 2' of space from side to side, and plenty of space lengthwise. 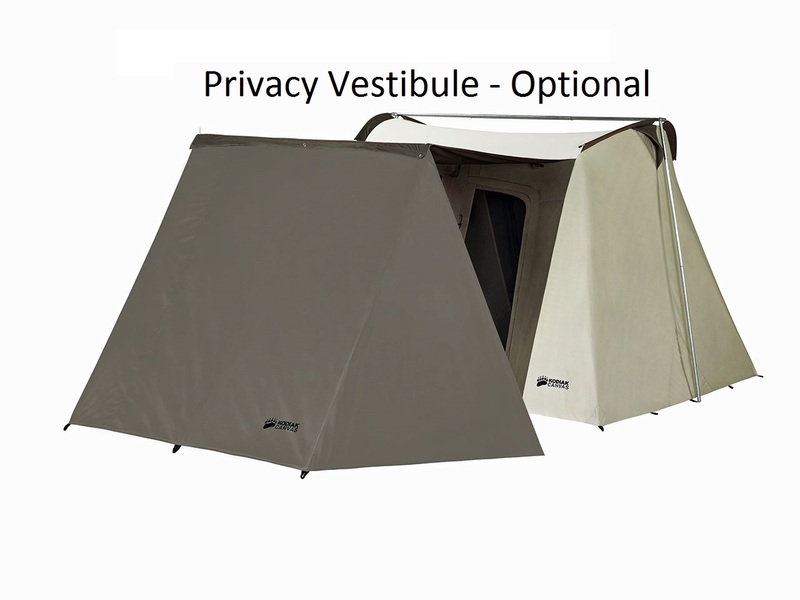 An additional person could be placed at the opposite end of the tent where the others are facing, that person would also have plenty of space. Their should be enough room for gear in addition to that. However, the best way to make sure is to measure a 10'x10' space on your yard or somewhere in order to visualize, or map out the needed space for sleepers and gear. A: I have this tent and there is enough room for maybe 3 people plus gear. My wife and i have plenty of room with gear for a long weekend. There would not be enough room for hunting with a couple of buddies. 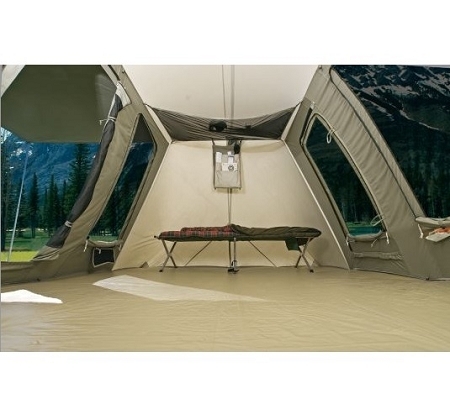 Q: Is the tarp material the same as the tent floors? A: The tents are canvas and the tarps are poly like most tarps. In other words, the tarps are not canvas drop cloths. Was this answer helpful? 4 of 7 Customer(s) found this Answer helpful. Q: Do you ship directly to Australia, or would I go through FedEx? Regards Keith. A: We do not, you would need to have us ship it to somewhere in the USA and then you would need to find a way to ship it from there. A: They are about half the Weight, about 35 lbs each. Q: can u put a wood stove in it? A: No, we do not recommend putting a stove inside. Sorry for the bad news. Was this answer helpful? 5 of 7 Customer(s) found this Answer helpful. Q: How can I get faster shipping? A: During checkout you can choose second day air or overnight shipping. Regular ground shipping is fast and it is free. Q: What wind speed will this tent withstand? A: There is no official wind rating. The manufacturer does not recommends using this in high winds. Having said that we have tested it independently and it has withstood up to 40 mph wind gusts. Q: Would a dog be able to fit if we have less than six? A: It depends on the size of the dog, but generally yes. It's not a bad idea to measure out 10' x 10' on the grass to get an idea of how much room you will have. A: We do. Add the item to the cart for a quote. Q: I see that model 6051 (basic model) has the #10 Coil zipper and 6010 (deluxe model) has the #10 YKK zippers. Which one is better? What are the differences? Q: Does this tent have a opening for an outdoor electrical cord to be able to hook up a fan in the summer time? A: It does not have an opening for an electrical cord. Only model 6133 and 6131 have the cord slot with zipper. Q: What tent will perform better in the wind, the 10 x10 or the 12 x 9? A: Both perform extremely well so this is a close one. The 12x9 would outperform the 10x10, because it has the additional ability to use guy ropes that can be staked down and provide extra reinforcement in wind. Was this answer helpful? 8 of 10 Customer(s) found this Answer helpful. Signing for the Package: Signature is required on these large ticket items for your protection. Once shipped the package cannot be rerouted or held at a local FedEx location - no exceptions. Before ordering please make sure you ship it to a location where you can personally sign for it. Dimensions: 50" x 12" x 11"